This week’s theme is TRAGEDY. What should the next comic be about? Should it be about Comedy? Romance? Or bee stings? The next comic should be ACTION ADVENTURE with a dash of MUSICALITY! lol, the last panel always crack me up. ALWAYS! Next comic should be a romantic comedy about bee stings. …or an octopus finding love on land. A CHOOSE YOUR OWN ADVENTURE COMIC. Lyle Lurlenblurbles gets a bee sting in next week’s romantic comedy! 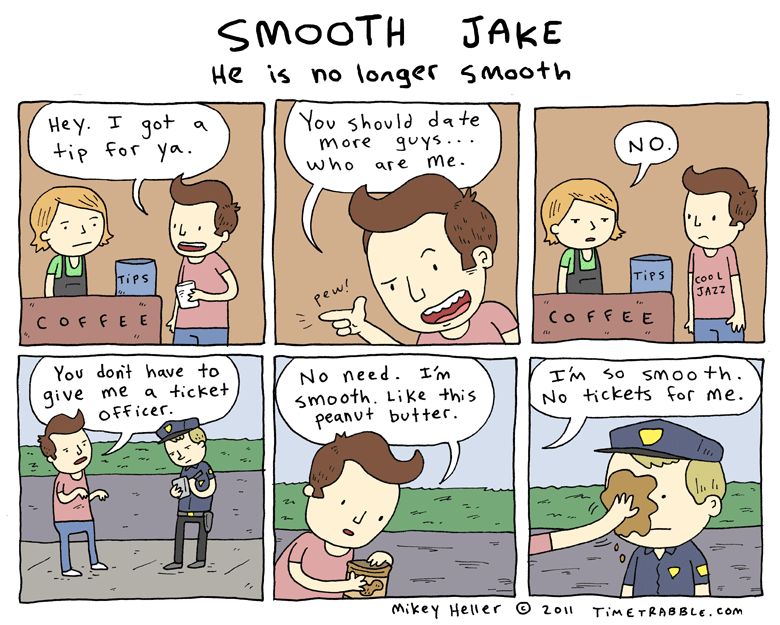 Fact: Smooth Jake actually got his name from his inability to grow facial hair. While this was a great example of tragedy, isn’t comedy the exact opposite of tragedy (Especially to the Greeks)? Wouldn’t a comedy comic break the tragedy theme? How tragic.